I love to visit Philadelphia! It’s the birthplace of the United States and has some of the best art, most diverse culture, and coolest vibe anywhere in the nation. There are so many fun things to do in Philadelphia. I’ve been to Philly many times over the years, and I keep a running list of things I’ve enjoyed doing while I’m in the City of Brotherly Love. I also have a wish list of places I want to see and things I want to do when I visit Philadelphia in the future. One of the neat things about Philly is that every time I go back, there’s always something new or exciting to do there. Philadelphia has many wonderful places to visit — and many of them are free! If you use CityPASS, it’s even cheaper to visit Philadelphia area landmarks — such as The Franklin Institute, Big Bus Company and Philadelphia Trolley Tours, Adventure Aquarium, and some of the other landmarks mentioned in this post. So get out your walking shoes… by the time you’re done seeing everything on this list during your trip to Philadelphia, you’ll have treaded tracks all throughout the Cradle of Liberty. Yo yo yo, locals — even if you’ve lived in Philly your whole life, I bet a figurative cheesesteak that there’s something on this list you haven’t seen or done yet! There’s so much going on in Philly it can be hard to figure out where to start touring there. Located in Center City in the heart of Philadelphia is Independence Hall, the historic building where the Declaration of Independence and the United States Constitution were born. Independence Hall was completed in 1753, was largely rebuilt during the 19th century, and is now a part of the Independence National Historical Park. This picturesque, 1-mile-long boulevard runs through the heart of Philadelphia on the northwestern side of Center City. Some of Philly’s most famous landmarks are found along the Benjamin Franklin Parkway — including the Cathedral Basilica of Saints Peter and Paul, Franklin Institute, and Free Library of Philadelphia. This Philly landmark was established in 1891 and is the nation’s 13th-largest public library. The collection at the Free Library of Pennsylvania includes more than 4 million items and includes large Charles Dickens and Beatrix Potter collections, antique maps, and an automobile reference collection. Chartered in 1876 for the Centennial Exposition, the Philadelphia Museum of Art is a culturally iconic landmark. The museum houses a collection of more than 225,000 pieces, including the wedding dress of the late Philadelphian Grace Kelly. Geno’s Steaks and Pat’s King of Steaks are where locals and tourists descend when they want a good Philly cheesesteak. The 2 are longtime rivals — and they stand right across the street from each other. I’ve been to both and can say each has its merits. But who has the best Philly cheesesteak sandwich? I’ll reserve my comment here and let you decide! What stands 548 feet tall, was the tallest habitable building in the world from 1894 through 1908, and has a statue of William Penn on top of it? Philadelphia City Hall! Besides being the seat of city government, it’s also one of Philadelphia’s most beloved tourists attractions. It even sports an observation deck offering incredible views some 499 feet above ground! One of the most scenic bridges in the Philadelphia area is the Benjamin Franklin Bridge. The 7,456-foot-long bridge opened in 1926, has a span 1,750 feet long, and is designated as Interstate 676 and U.S. 30. The Benjamin Franklin Bridge crosses the Delaware River and connects Philadelphia to Camden, New Jersey. Sports fans love Philly because it has one of the best arrays of professional sports options in the nation. The Philadelphia sports scene includes the Philadelphia Eagles National Football League team, Philadelphia Flyers National Hockey League franchise, Philadelphia 76ers National Basketball Association team, and Philadelphia Phillies National Baseball League team. 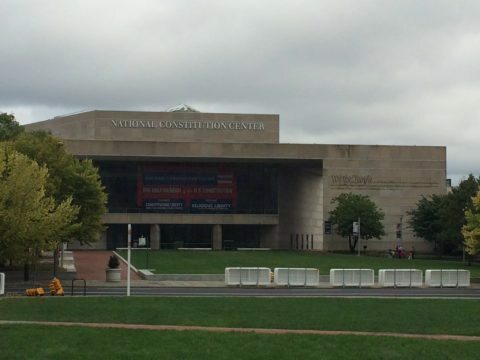 The National Constitution Center houses the United States Constitution and other founding documents. The museum also features traveling exhibits and a really cool attraction called Signers’ Hall, where 42 life-size bronze statues of the Founding Fathers — including my ancestor Roger Sherman. Federal Donuts in Philadelphia is one of the most unique doughnut shops anywhere. Yes, they offer coffee and doughnuts, including spicy PB&J, maple bacon, and mint chocolate cookie doughnuts. But that’s not all. Federal Donuts is also well known for their… fried chicken! Their Korean-style fried chicken is made in various flavors and keeps even the most discriminating of chicken chompers coming back for more. Some “raven”-ous readers know that one of America’s most famous 19th-century suspense writers once spent 6 years living in Philadelphia. Of course, I’m talking about Edgar Allen Poe, the man who wrote such classics as The Raven, The Tell-Tale Heart, and The Purloined Letter. Fans can stop by the Edgar Allen Poe Historical Site, where visitors to check out the author’s home in Philly and learn more about this iconic writer’s life and times. Tour the United States Mint, where the nation’s circulating coins are made. Philadelphia has been striking federal U.S. coins for circulation since 1793 and is the main mint in the United States. With the exception of the penny, most coins made at the Philadelphia mint contain a small “P” mintmark. As a coin collector, I love visiting this Philly landmark — I know even non-coin collectors will enjoy seeing how our nation’s coinage is made, too! More than 1,300 animals reside at the 42-acre Philadelphia Zoo, which is located just northwest of Center City across the Schuylkill River in West Philadelphia. The world-renowned zoo includes an array of animals, many endangered, living in sanctuary — including giraffe, western lowland gorillas, Sumatran orangutan, Amur leopard, and the northern bald eagle. When the Forrest Theatre was built in 1928, it was one of the nation’s finest showplaces. The historic landmark cost an impressive $2 million to build (a huge sum in the 1920s) and is one of Philadelphia’s best places to catch a show. The Forrest Theatre, which has been operated by The Shubert Organization for more than 8 decades, boasts an exciting schedule of shows during the performance season. The Liberty Bell was originally created in 1751 to commemorate the 50th anniversary of William Penn’s Charter of Privileges, which was Pennsylvania’s first Constitution. The Liberty Bell also rang from atop Independence Hall on July 8, 1776 to celebrate the first public reading of the Declaration of Independence. The Liberty Bell’s iconic crack is thought to have formed in the early 1840s, and by 1846 the fracture was so bad it made the bell unringable. The Liberty Bell now sits safe and sound in a modern-styled National Park Service building beside a large window overlooking its former home: Independence Hall. The 9,200-acre Fairmount Park is the world’s largest landscaped urban park and one of the most beautiful city parks anywhere. Fairmount Park allows you to escape the hustle and bustle of Philadelphia while never stepping too far from it. The historic park provides incredible views of the Philadelphia skyline, awesome autumn color and spring blooms, and miles of trails along the gorgeous Schuylkill River. Whether you’re Catholic or non-Catholic, religious or not, you’re sure to enjoy your visit to the Cathedral Basilica of Saints Peter and Paul. The soaring cathedral, located along the Benjamin Franklin Parkway at 18th Street, features Roman-Corinthian architecture and was dedicated in 1864. The cathedral holds daily Masses and is the seat of the expansive Diocese of Philadelphia. If you’re in Philadelphia and want to enjoy an incredible entertainment experience, make sure you check out the schedule of events at the Kimmel Center for the Performing Arts. The state-of-the-art world-class concert and performance hall has one of the best show schedules in the nation and is located in the heart of Philadelphia at the corner of South Broad Street and Spruce Street. The ’76 Carriage Company offers scenic horse carriage ride tours of Philly 7 days a week. The horse-drawn carriage rides take guests throughout Center City and past some of Philly’s most famous landmarks. One of the oddest, most interesting places to visit in Philadelphia is The Mütter Museum. It’s where some of the most bizarre, unusual, and breathtaking (or creepy) medical phenomena from the past are on full display for the public. These include the Soap Lady and pieces of Albert Einstein’s brain. It’s the kind of place budding doctors and nurses might find thrilling but you and I might find chilling. Just don’t lose your head when you’re greeted by the 139 stone-faced peeps at the Hyrtl Skull Collection! Want to know one of the best ways to see all Philadelphia has to offer? Take in a bird’s-eye view atop the One Liberty Observation Deck in Center City! This 57-story-high observation deck at One Liberty Place is open from 10 AM to 10 PM daily and is an awesome place to catch some stunning views. During his morning workout routine, Rocky (Sylvester Stallone), also known as South Philly’s Italian Stallion, triumphantly ascends the 72 stone steps as the film’s soaring theme song, “Gonna Fly Now,” crescendos in the background. 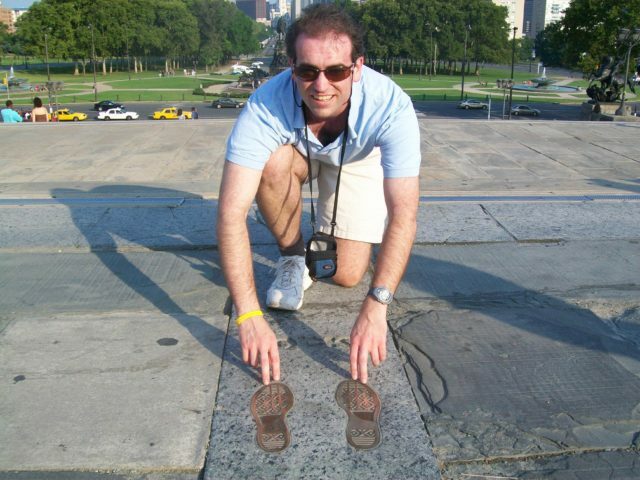 Since the first Rocky film was released in 1976, millions of others, including my family and I, have ceremoniously climbed the Rocky steps. While you’re at the museum climbing the steps like Rocky, you should also check out the bronze Rocky statue near the steps. It was made in 1980, and Stallone donated it to Philadelphia after its 1982 appearance in Rocky III. Formally called JFK Plaza, Love Park is one of the most photographed sites in all of Philadelphia thanks in large part to its famous LOVE statue. The last time I was in Philly, Love Park was closed for renovations, and its famous Robert Indiana LOVE statue had been relocated to Dilworth Park. But when JFK Plaza reopens sometime in 2017, the LOVE statue will be restored to its former home and the park will boast tons of upgrades. And what’s not to love about that? Philadelphia is a big city. It’s on par with Chicago, San Francisco, and other places where lodging and eating can be expensive. Of course, not everyone has to be budget conscious like I am, but it never hurts to save money when you can. #1 – As far as hotels go, I’ve never actually stayed overnight inside Philadelphia proper, but rather have lodged outside the city. I have some personal connections to that city. It’s just a 30- or 40-minute drive from Philadelphia (basically only a typical morning commute’s drive). It’s so much cheaper to stay in a hotel in northern Delaware than in, say, Center City. There’s also no sales tax in Delaware. Still, others prefer lodging in West Chester, west central New Jersey, or in the northern Philadelphia suburbs, where hotel rates are also generally cheaper. #2 – Speaking of prices, it can be very expensive to park your car in Philadelphia. I paid nearly $20 to park for just 3 hours in the AutoPark under Independence Mall. Then again, parking your car along the streets of Philadelphia in designated parking zones is often free — but it’s potentially riskier, too. Most street parking spaces in Philadelphia aren’t necessarily secured or under surveillance. #3 – Once you park your car, be sure to enjoy the local food. I’m a big Philly cheesesteak guy, but there’s so much more to eat than “just” cheesesteaks in Philadelphia. The city has epicurean delights representing every pocket of the United States and every corner of the globe. But if you find you’re spending too much dough on restaurant grub, do what I do and grab a hoagie at Wawa or stop by the nearest Acme grocery store for money-saving snacks. #4 – In addition to saving money, don’t forget to save your back and stay safe in Philadelphia! It’s a wonderful city, and the Philadelphia police do an amazing job protecting citizens and visitors. It’s a big city nevertheless, and things do happen there. Don’t look like a tourist when you visit Philadelphia. Don’t flash your cash in public. #5 – Most importantly? Have fun in Philly! It’s an awesome place and one of my very favorite cities to visit. I know you’ll have a great time in the City of Brotherly Love, too.